Let's Do It for ME! : Press Release for IiME's Big Break win of £2000! "Thanks to a tremendous effort from (over 3500!) supporters and colleagues Invest in ME were able to win the Direct Debit The Big Break 100 good causes initiative for April. 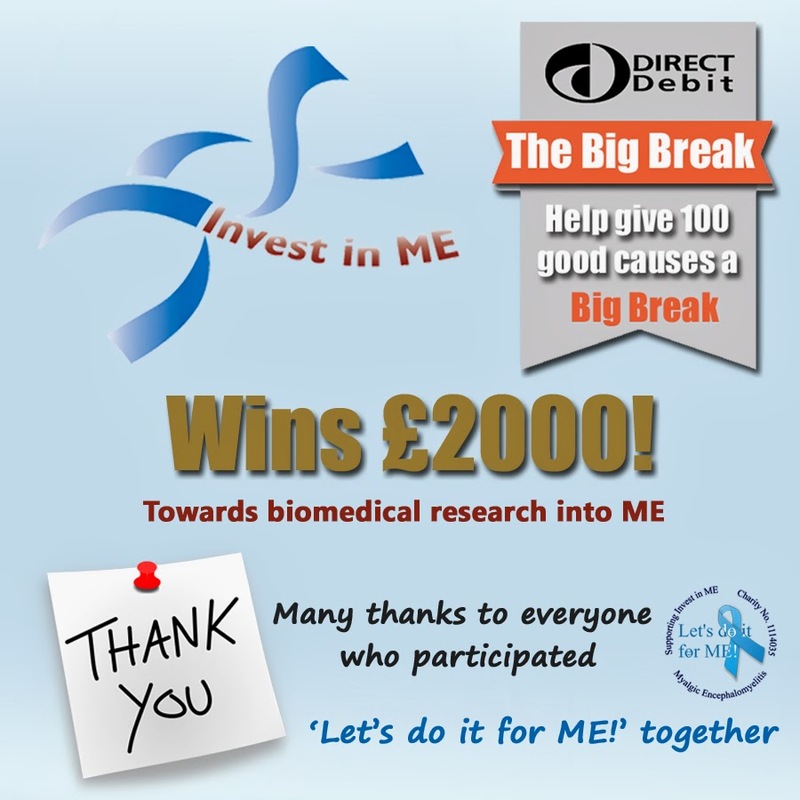 Apart from winning the first prize of £2000 - all of which has gone directly to the IiME Biomedical Research Fund to support biomedical research into ME - this has also created much needed awareness of ME in the public. Here is the Direct Debit press release .. "
Independent UK charity, Invest in ME (IiME), has received an unexpected windfall in a nationwide campaign to give 100 good causes a Big Break, courtesy of Bacs Payment Schemes Ltd (Bacs), the organisation behind Direct Debit. Each month Bacs is setting aside a £5,000 pot to be shared between charities and good causes and is encouraging members of the public to vote for their most deserving good cause. The charity with the most votes will win £2,000, the second most popular will win £1,000 and the remaining £2,000 will be shared between 200 runners-up. Invest in ME, a charity run by volunteers, campaigns for research and funding to establish a better understanding of the causes of Myalgic Encephalomyeltis (M.E.) and help develop better medical treatments for the illness. And the charity is now £2,000 better off after coming out top in April’s public voting. 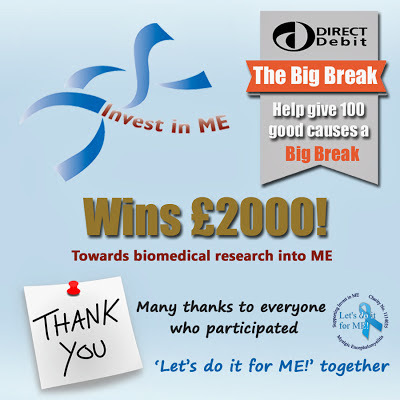 Let's do it for ME supporters have energised biomedical ME research. Thank you so much for your support fro, the team at Let's do it for ME!